Senior NHS female doctors are earning less than their male counterparts, a BBC investigation shows. 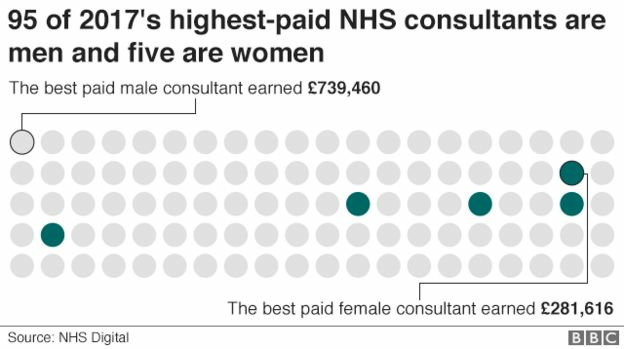 Of the top 100 earning consultants in England, just five are women, despite more than a third of the workforce being female. The top-paid man earned nearly £740,000 - two-and-a-half times that of the top woman. 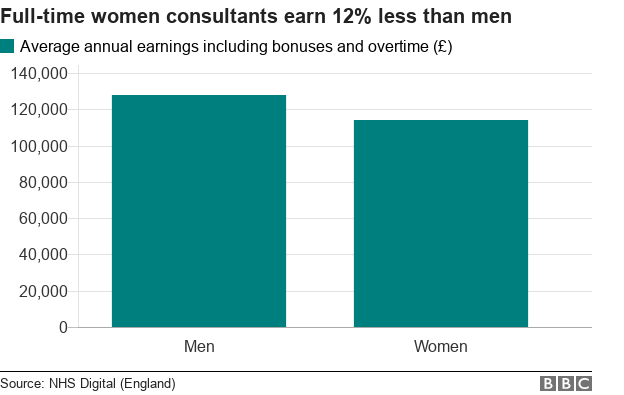 On average, full-time women consultants earned nearly £14,000 a year less than men - a pay gap of 12%. Senior female doctors described the findings as "disappointing" and said it showed more needs to be done to tackle the gender pay gap in medicine. The figures were obtained by the BBC following requests to individual health trusts, the government and NHS Digital. Some doctors the BBC spoke to said some of the difference was probably down to the fact men were more likely to do overtime. But they said it was clear some of the gap was unfair with the system of bonuses and awards weighted in favour of men. Dr Anthea Mowat, of the British Medical Association, said despite recent progress on gender pay, the figures obtained by the BBC showed there was "clearly still a long way to go". She said women needed more support, including leadership training, mentoring and more flexible working opportunities. "With women making up the majority of medical graduates in recent years, it's vitally important that we address the root causes of the gender pay gap, and develop a wider programme of work to eliminate it across the medical workforce," she added. Dr Jacky Davis, a radiologist and former chair of the NHS Consultants Association, said she was "surprised and disappointed" by the figures. "Some of it we can explain - men are more likely to do overtime for example - but that doesn't account for it all. In my experience men are better at pushing for more money, putting the case for awards and they get them." Dr Sally Davies, of the Medical Woman's Federation, agreed. "We need to do more to support women. They often fall behind when they have children and have to take time off. "By the time they get to the point where overtime is available or the awards are being handed out they find themselves behind men. It's a serious problem." Danny Mortimer, chief executive of NHS Employers, said: "This appears to be a long-term and serious problem within the medical workforce which the government, the profession and employers are committed to resolving." He said one of the causes was the consultants' contract - in the past it has been argued it allows high premiums to be charged for overtime and creates a bonus system that is skewed. The government and BMA are currently in negotiations about the future of the contract. The Department of Health and Social Care said: "We are committed to ensuring that our hardworking doctors are rewarded fairly and equally for their work — regardless of gender — and have commissioned an independent report alongside the medical profession to examine exactly how that can be achieved."